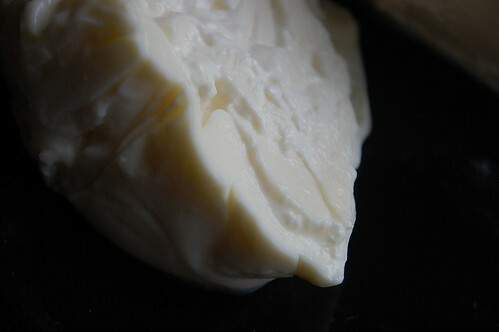 If fresh buffallo mozarella and provolone cheese jostle for the gold medal of Italian pasta filata (spun paste), then burrata stands without question in platinum position. And worthy of an ode. I first heard of burrata from Pierino, a stalwart on food52 whose culinary vocals are fraught with Italianess – Market Style Porchetta and Waiting for Bonaparte Muffaletta (the remix edition), two of his recipes showcasing the motherland. It was two weeks before we moved, on a Tuesday afternoon that I spoke with my friend E, asking her if she’d like to go to Amsterdam that weekend. Why, she asked? Well because I’d found that a restaurant served burrata. Did she know the cheese? No, she’d never heard of it but she was willing, like me to drive the 60 minutes or so it required (one way), just to find out. The following afternoon, I took myself on a lunchtime stroll in The Hague and down the Bankastraat – a street I’d only just discovered, a few minutes walk from my office in the heart of the city. I walked into a nice-looking delicatessen but the long queue pushed me back out of the shop and unto the streets. A quarter of an hour later I was back and chatting to one of the guys behind the counter. A conversation on burrata ensued and he pointed me to plastic jars in the fridge. Eyes wide with shock and doubting Thomasina that I was, he bid me to lift up a jar and look beneath to see the contents. 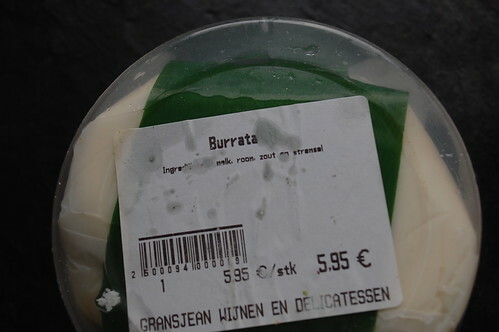 And there it was, spelled out before my eyes in some odd font ‘Burrata’. Why all the fuss you might ask, just for cheese? Because burrata is the best of fresh mozzarella and more (cream) on a plate. Take fresh curds, stretch them out into a smooth blanket, which you pull up at the corners to form a small ‘gold’ sack, then fill the centre with cheese rags and top up with cream. Knot your cheese money bag and you have treasures on the table. “Burrata”, from burro meaning “butter” in Italian, refers to the creamy soft texture of an artisan cheese which rose to popularity in Puglia, the south of Italy in the 1950s when factories found it a way to utilize the ritagli (“scraps” or “rags”) of mozzarella. It is produced from cow/buffalo milk, rennet and cream. Nora Singley writes in The Kitchn: ‘Let’s get one thing clear: Burrata is not mozzarella. 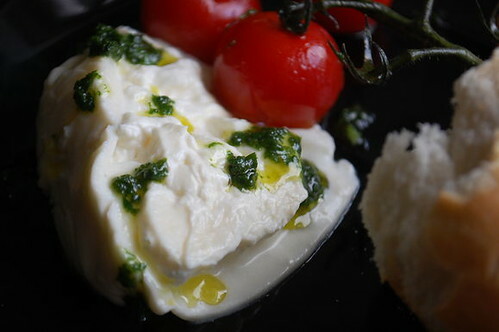 And burrata is not buffala mozzarella, although it’s made from buffalo milk. Burrata is its own thing entirely, and you’ll know this the second you taste it. Perhaps some of the confusion has come from its tradition, which tells of a cheesemaking process that was born from another: burrata was made in order to rescue the little scraps of mozzarella di bufala that were leftover in the cheesemaking vat. In understanding the makeup of burrata, however, it’s helpful to summarize a bit of what we know about mozzarella. 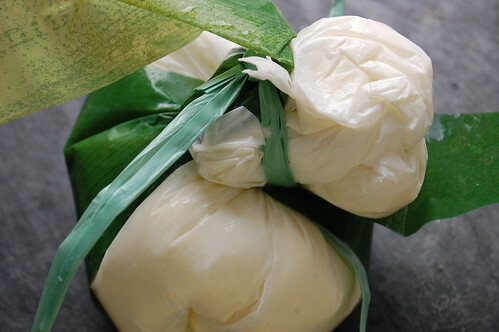 Mozzarella is what’s called a pulled curd or pasta filata cheese, which means that it’s formed from the elastic curd of fresh milk, still warm and straight from the vat. Burrata is made of that same stringy cheese, but is formed not into a solid ball, but into a little hollow pouch, which is then filled with fresh cream and soft stringy bits of curd, the ritagli, or rags, remaining after mozzarella making. It’s all tied off at the top, and then wrapped in the fronds of an Italian plant called asphodel (a relative of the leek). 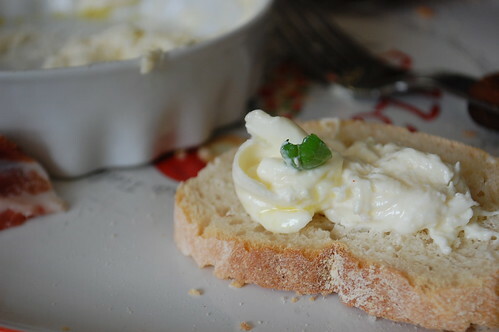 Speaking to my Italian friend and colleague, he educates me on the art of eating burrata and fresh buffalo mozzarella. First up, the cheeses are best eaten at room temperature, not directly from the fridge. To accomplish this, he plunges the bags of cheese in lukewarm water for up to a quarter of an hour, before serving. And so did I! The same colleague recommended fig jam and fine coppa, dried meat from the neck of a handsome pig as worthy accompaniments for the burrata. To garnish? The finest olive oil money can buy with some basil leaves. As my only claim to Italian citizenry was a visit to Rome three years ago, I sensibly followed his advice – with no regrets. 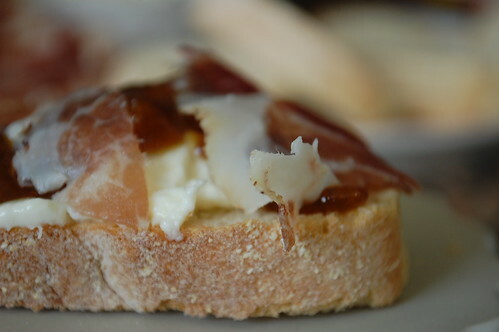 The combination of creamy cheese, salty meat and sweet, fruity fig jam, set atop slices of ciabatta was to die for. With a crisp Italian white wine. We sat, 5 adults and devoured the lot before our pizzas arrived and we transitioned from starter to main. That night, my friend E said she would go back to the shop where I’d bought it to get some for another friend of hers. Just to be sure I could define the flavor profile, I asked her to help me purchase some more, along with a few slices of the coppa. The story she told on her return was weird but wonderful. When she arrived the shop on a Friday afternoon and began to place her order which included my coppa, a guy behind the counter asked her ‘Is this for the black lady?’, to which she…..in shock as to how he knew, said ‘Yes’. He then pointed out the exact coppa (which I’d gotten first time around) she had to buy. She asked him how he knew it was for me and he shrugged his shoulders and said ‘I just knew’. Note that as of the 19th of August 2011, the Hague had 499,505 inhabitants (less the 5 members of my family) – the third largest city of the Netherlands, after Amsterdam and Rotterdam. Though strictly speaking, we didn’t live in the Hague. Still, that singular event was sufficient to stun E, and I and perhaps the gentleman in question and support the fact that the world indeed is a small place. 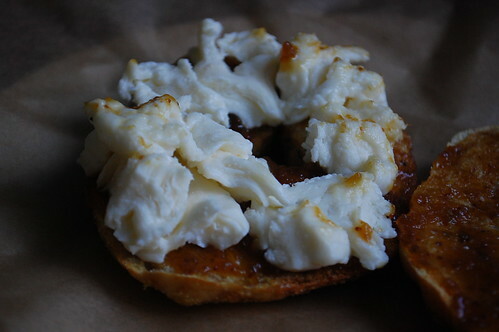 Where homemade bagels are glad to spend their days sliced and buttered with burrata and fig jam. 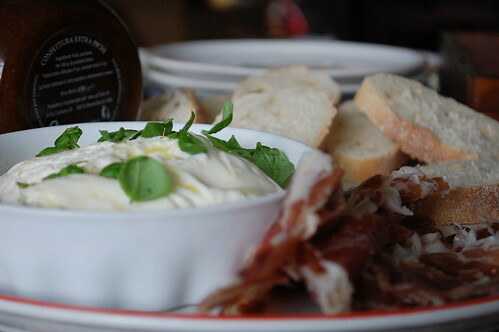 The second batch of burrata was served up with flash-fried honey cherry tomatoes, but retained the foremen of basil, olive oil and coppa.It was as well received as the previous. With some delicious French bread to boot. Good food crosses boundaries. 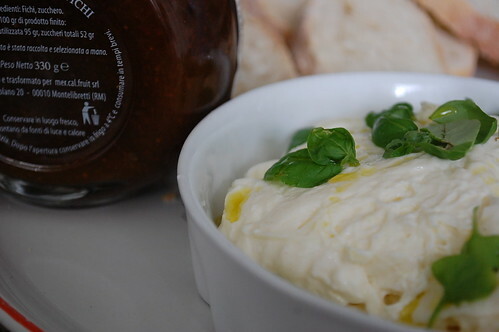 My friends and country men, food lovers the world over……try burrata and if you find it not to your liking, strike it off your list of favourites. But….try it first. And if you would rather make your own but don’t know how, this great tutorial from Sunday Suppers with its step-by-step guide will set you on the straight and narrow. If you don’t fancy some chewy, salty meats to accompany your panna, then check out Greg of Sippity Sup’s persimmon and pomegranate salad which made him some great new neighbours (hint – they had a persimmon tree)!